Look at all the Poké Balls you can’t use! Simply put, this challenge restricts you from using any type of Poké Ball, thus preventing you from having a diversified team. While you get to keep your starter—almost a rarity in challenges like these—you’ll be hard-pressed to find the rest of your team. More specifically, the only Pokémon you can use are the following: starter Pokémon, gift Pokémon, fossils, prize Pokémon (i.e., those from the game corner), and event Pokémon (this last one being optional, seeing as many event giveaways are pretty strong). Because of its over-reliance on Pokémon given to you by NPCs, some players also call this the Gift Pokémon Challenge. While its origins are unknown, GameFAQs member Pyrostormer has the earliest thread on the challenge, which was done on Pokémon Diamond. No tips, really, as the difficulty of this challenge depends on which game you choose. FireRed and LeafGreen have the luxury of the Game Corner prizes which, combined with the seven gift Pokémon, makes for eleven choices, more than enough for a full team. On the other hand, Ruby, Sapphire, and Emerald only have four possible team members: your starter, a fossil, Castform, and Wynaut. 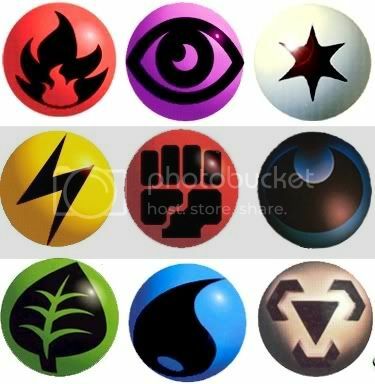 Good luck beating the Elite Four using only those! It doesn’t really get more straightforward than “no Poké Balls”, but there have been variants of the challenge where players restrict the number of Poké Balls they use in the run instead of banning Poké Balls all together. A more popular variant, the Poké Ball Challenge, is more focused on the completion of the Pokédex. As the name implies, it restricts the player from using any ball other than the Poké Ball to catch Pokémon, excluding times where it is necessary such as the Safari Zone and events. While it sounds simple on paper, trying to catch all those legendaries without any buffed Poké Balls is more frustrating than you think. There are many ways to up the difficulty of your game by taking out a particular component. A popular choice is the Pokémon Center, with its close friend the Poké Mart. Restricting yourself from using either (or both, if you’re up for it) puts the pressure on how you use your moves and items, and it’ll change the way you see those berries you find in the trash cans of the S.S. Anne or the six Soda Pop you get from the shop in Route 109. You can also try going through the game without the Exp. Share, without grinding your Pokémon to obscene levels (i.e., your team’s levels should never reach the highest level of the next gym leader before battling said gym leader), without TMs, without using any money, and so on. The possibilities are endless, and they could make for some interesting challenges! 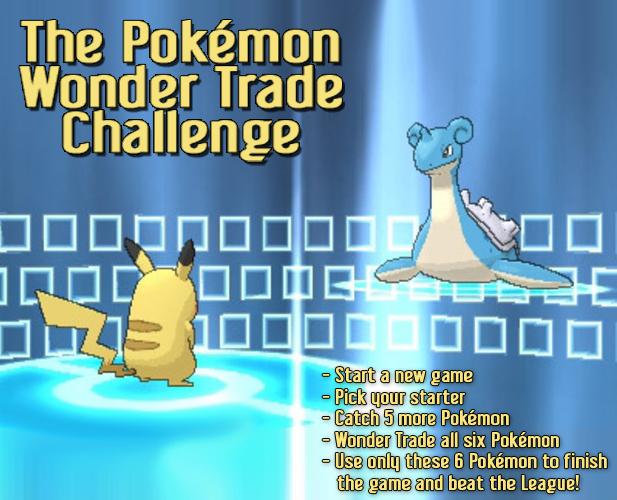 A challenge specifically made for Pokémon X, Y, Omega Ruby, and Alpha Sapphire (and any future main series games that keeps the feature), the Wonder Trade Challenge dares you to start your game, get a full team in the first route (your starter + five caught Pokémon), and send all six of them away to the amazing world of Wonder Trade. Whichever six you get will be your permanent team for the rest of the playthrough. While not explicitly stated in its rules, it’s pretty much understood that the only time one can catch a Pokémon normally after the first five is when none of your team’s members can learn an HM needed to progress. The idea for the challenge came about as early as two days after the release of Pokémon X and Y, with this thread from GameFAQs and this thread from Marriland being some of the earliest. Though if you’re like me, you may have first heard of this challenge when you saw the image above. As Wonder Trade is completely random, this challenge largely depends on what type of Pokémon you receive. What adds to the challenge, though, is how a huge number of these wonder trades bring back Pokémon you commonly find in the first route, such as Zigzagoon, Bunnelby, and Poochyena. While you might be lucky to get a 5 IV Protean Froakie, don’t be surprised if the rest of your team will consist of Pokémon from Santalune Forest and Route 102. Many players who take this challenge impose a few rules that would make it slightly more forgiving. One of these is the duplicate clause, in that if one receives the same Pokémon in Wonder Trade, one can send it back for another Pokémon, which can be done until your team consists of six unique species. Some players also take heed of the level of the Pokémon that they receive; as it is a challenge, these players also apply the rule of trading away Pokémon which are ridiculously over-levelled. I mean, what’s the fun in blazing through X or Y with a Level 49 Trevenant someone caught in Route 20? A variant of the challenge—though it could be its predecessor, seeing as it’s the term used in the two threads linked above—is the Wonderlocke Challenge, which as the name implies combines this challenge with Nuzlocke. It proceeds like the usual Nuzlocke, except that instead of using the first Pokémon you encounter in each route, you have to send these Pokémon through Wonder Trade before progressing. That way, the limitations of Nuzlocke are a bit softened, but you also have the challenge of getting completely unexpected teammates! One of the grandfathers of challenges, and most probably one of the challenges that was done before the notion of challenges were even popularized, the Monotype Challenge follows the simple rule of having a team of six Pokémon that share a common type. Sometimes called the Gym Leader Challenge because of how it resembles the teams of your favorite trainers to beat, first-timers of the challenge will find it surprising how restrictive this simple rule can be. As it is a very old challenge, its origins are largely unknown, though all of the big Pokémon forums are guaranteed to have a thread for it as far back as Gen 3. The difficulty of a Monotype run is entirely dependent on which type you choose for it. Water and Flying usually have the easiest runs, as there are many common Pokémon evenly distributed throughout the games. Grass and Fire may seem appealing as you get to keep your starter, but their difficulty can spike depending on the game you play – a mono-Grass run in the Hoenn games is much easier than one in the Johto games, while a mono-Fire run in Diamond and Pearl is limited to only two Pokémon pre-E4! Types such as Dragon, Ghost, and Steel are much more difficult choices, not only because there are fewer Pokémon to choose from, but also because a bulk of these Pokémon are available late in the game. While you can start with Treecko in ORAS for a mono-Dragon run thanks to Mega Sceptile, the next earliest team member, Swablu, is three badges away, which means you have to go through almost half of the game with only one Pokémon. 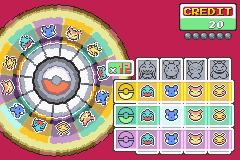 Some players make it slightly easier by trading the eggs of six similar-typed Pokémon over and hatching them before the start of the run so that you can choose the more obscure types. (I mean, unless you want to be limited to Gastly and Misdreavus for your mono-Ghost HGSS run, it’s your only choice.) Others increase the type limit to two, allowing for a much wider selection of Pokémon. Some take it to the next level and completely follow the alternative name of the challenge to the letter, in that they only restrict themselves to the Pokémon used by a certain gym leader. Though as much as I’d love to have a Falkner run using only the Pidgey line, these challenges usually take into account their teams in rematches and future games. “Mono-” challenges are very popular, and you can attach many terms to that prefix to get an interesting challenge. Monochrome only allows a team of Pokémon that share the same color, while Mono-egg group follows the different egg groups instead of the different types. Monogen restricts you to only using Pokémon introduced in the same generation, with Pokémon Black and White completely adhering to the rules of this challenge. Other Mono- challenges can take almost inconsequential similarities and give you a fun set of Pokémon to work with. Try building a team that share the same first letter in their names, or the same number of limbs, or of a certain multiple in the regional Dex. The results may surprise you! The Scramble Challenge relinquishes the decision of choosing the members of your team from you and gives it to six other players. Popular in Pokémon forums, Scramble Challenges are a great way to put some zest in your game (if you’re the challenger) or to flex your creative minds (if you’re the giver of the challenge). The latter is one of the most inviting features about this challenge, as coupled with the team member you give to the player, you also have to create specific restrictions for that Pokémon with regards to its evolution, moveset, and everything else you can think of. It could be as easy as “Let Mudkip beat 11 gym trainers before evolving into Marshtomp” or as out-there as “Let Marshtomp solo 20 trainer-owned Grass-types of equal or higher level using only STAB moves while holding a Miracle Seed to evolve into Swampert, but only after Level 50 and when it has three hearts in Amie”. Like Monotype, Scramble Challenges go way back, and it’s difficult to determine where it originated from. Due to its collaborative nature, it may have been created in a Pokémon forum or discussion board, which is where you will find threads for them nowadays. This should come as no surprise to you, but part of the fun of Scramble Challenges is how unexpected their difficulty can be. As a rule of thumb, your original post asking for team members should state how lenient or harsh you want the challenge to be. Should you not mention anything about taking it easy, you’re bound to get a lot of difficult and overly specific restrictions! As said above, one of the good things about a Scramble Challenge is how you have some control over how difficult you want it to be. A variation called Random Challenge takes out the restriction part of the challenge all together and instead simply asks for six random Pokémon from six random people. On the other end of the spectrum, Scramble Challenges can get intense depending on the kind of restrictions you receive. You might have to go through the game using a Feebas that isn’t allowed to evolve until the Champion battle, or a Clefable whose only possible damaging move is Metronome. That’s part of the insanity of Scramble Challenges and why it’s so popular. Egglocke, though its name suggests it’s a variation of another challenge on this list, works almost exactly like Scramble Challenges, except that instead of team suggestions, six other players will give you random eggs that you have to hatch at the beginning of the game. The suspense of only finding out who your team is after these eggs hatch is what makes this a very fun alternative, and one that’s been getting a lot of popularity with the much smoother inter-game communications of the later generations. Some challengers also incorporate the Mono- challenges when asking for Scrambles, in that they request for challenge-givers to adhere to a certain theme. Want to have a mono-Dark run in Y but can’t decide what to pair with your Greninja? Or want a team that have restrictions emulating the main cast of Friends? It’s part of the beauty of the Scramble Challenge – it encourages you to go all out. The epitome of the term “challenge” in Pokémon, the Nuzlocke Challenge follows two very simple but very difficult rules: one can only catch the Pokémon you first encounter in a route, and one must release a Pokémon if it faints at any point in the run. These simple-sounding restrictions makes your run a million times harder, and it has forced players all over the world to rage quit their challenge runs because of an untimely critical hit or a mispredicted switch. If all of your Pokémon faint, it’s game over, and you will have to restart your run. An often-cited third rule of the challenge is that you must nickname all of the Pokémon you have the luxury of catching. This third rule puts importance to how you as a player should care for your team, given the dire circumstances you’re working with. You may not like that Rattata you caught in Route 1, but when it’s suddenly in the red HP mark in the middle of your final battle against Giovanni, you start appreciating Scabbers a whole lot more. The Nuzlocke Challenge came out of a web comic of the same name, with the medium being one of the core reasons why it has become arguably the most popular Pokémon challenge nowadays. True to its origins, many – and I really mean many – players document their runs in creative ways, whether it be through comics, videos, or fanfics. I mean, if you lose your hard-trained Quilava to Whitney’s damn Miltank, you’d also be glad if you read a comic depicting that bitter heartache, right? There’s really only one way to make the most out of the Nuzlocke Challenge, and that’s to keep playing it. A lot of people quit midway through the run or relieve themselves of one of Nuzlocke’s rules, and while that may keep you sane, it really takes away a lot of the fun of the challenge. It didn’t become popular by being easy, so you should expect tragic things like your only decently trained Pokémon fainting to a critical hit or half of your team having to be changed after a tough gym battle. That’s the way Nuzlocke is, and that’s why it’s so addicting. A Nuzlocke run is only really defined by the two core rules mentioned above, but many players have added on to these rules to make their Nuzlockes either a bit tamer or much more difficult. Some players allow themselves to use a maximum number of Revives for untimely faints and simply impose stricter restrictions to the revived Pokémon. Others impose a duplicate clause, in that if the first Pokémon you find in a particular route has already been caught, it wouldn’t count towards the first rule. For those who want to take it up to eleven, many of the self-imposed restrictions related to the No Poké Ball Challenge mentioned above can also be applied to the Nuzlocke Challenge. It would be significantly harder to keep your team from fainting if you can’t use the Pokémon Center and/or the Poké Mart. In fact, you can merge the No Poké Ball Challenge with the Nuzlocke rules, too. Think having a team of four in the original Hoenn games is hard? What if you’d have to release them if any of them faint? It’s beauty in madness, really. Oh, lots and lots more, so much so that there’s an entire wiki dedicated to documenting the different types of Nuzlocke challenges out there. Egglocke and Wonderlocke were already mentioned above, but those are just the tip of the iceberg. Popular variants like Wedlocke and Chesslocke give certain roles to the members of your team which come with their own restrictions. Other variants like to further restrict what type of Pokémon you’re able to catch, limiting them to certain types or attributes. The two core rules of Nuzlocke can also be applied to all four challenges above, which means you can have a Scramble Nuzlocke run or a Monotype Nuzlocke run. Whatever other restrictions you put, as long as you stick to the two rules above, you’re bound to have an interesting Nuzlocke. Nuzlocke’s ability to be compounded with almost every other challenge, and to be a formidable challenge on its own, makes it, in this writer’s opinion, the best way to make your game run more challenging. This entry was posted on Sunday, April 19th, 2015 at 5:30 am	and is filed under Articles, Top Lists. You can follow any responses to this entry through the RSS 2.0 feed. You can leave a response, or trackback from your own site.